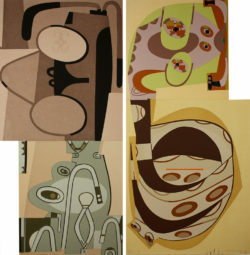 David Storey, Untitled (1999), linoleum cuts, 31 7/8 x 16/ 13 inches and for 31 7/8 x 13 7/16/ 16 inches. 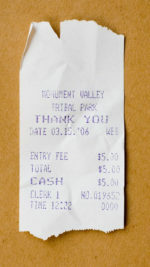 Edition of 15. Printed and published by Grenfell Press, New York. Leslie Miller I kind of backed into it—I bought a press I knew nothing about. I went to an auction with a friend and he dared me to bid on it. I bid a hundred dollars and nobody bid against me: I owned a 2,000-pound Vandercook. DS Congratulations! And a Vandercook is a letterpress? LM It’s a letterpress. It’s made for pulling reproductions of lead type. DS How did you have it moved? LM Oh, the hundred-dollar press cost $300 to move three blocks. DS That sounds about right. LM Then I got the second press about six years later. That was a $300 press that cost $1,200 to move. DS Did the press move here to this studio? LM Yes. This was an etching printshop where I was working at the time. I had it over in a corner. And over a period of 35 years I rented more and more of the studio. DS So you have a background in etching? LM I do. I studied etching in college quite a bit. I didn’t know anything about Vandercooks, but printing is printing. I started printing books that were just poetry and fiction. DS Did you bind them yourself? LM No. I have a very good bookbinder named Claudia Cohen who does all the books. She’s probably the best in the country. DS When did you decide to start working with prints? LM It was through the books. The first couple of books were just type and then I started inviting artists to collaborate with writers. DS That’s interesting—that even though you had studied printmaking, you got into making prints through letterpress experience and printing that way. DS Who are some of the other poets you’ve done books with? LM Poets… Peter Cole, Eliot Weinberger—he doesn’t really consider himself a poet, he’s more of an essayist, but I think he’s a poet. There’s a lot of fiction. There’s Charles Simic. That was a Whitney book that we did many years ago, in 1996. There’s more fiction than poetry. And now that I say that—this is fiction by John Ashbery. DS And these are silkscreens? Trevor Winkfield and John Ashbery, Novel (1998), limited-edition book with 10 drawings by Winkfield accompanying Ashbery’s previously unpublished 1954 text; bound by hand with screenprinted covers, 24 pages, 12 1/2 x 7 inches. Edition of 100. Signed by the author and artist. Printed and published by Grenfell Press, New York. Image courtesy Planthouse. LM This whole book is relief print—polymer—from drawings that he did. DS It’s so unusual to see something so starkly black and white. LM It is so black and white. Although we did a book last year for MoMA that was on fluorescent white paper. Nothing looks white again after that. DS Did you have any preference for younger authors? Emerging authors? Poets? LM That’s so hard to say. I didn’t have a plan. Never had a plan. If I saw a great manuscript I’d try to think of an artist. …There are times when the artist and writer never met; there are times when they worked back and forth. Maybe it started with a poem and then the artist would do something and the writer would respond to that. It’s more fun when there’s real back-and-forth. That results in a sort of three-way collaboration between the printer and the artist and the writer. But there’s no formula, that’s for sure. DS One of the essential things to talk about is the more sustained collaboration between the artist in the shop and the printer, the person who’s actually making the print happen. LM There’s no formula for that either. Sometimes the artist has an image in mind; sometimes they have absolutely nothing in mind. Sometimes I’ll pull out a stash of really great paper and that’s where it’ll start. DS I have to mention something right here about your library of paper—the astounding variety and amount of beautiful paper that you have on hand. LM That’s something that we should look at because it’s a big part, I think, of the prints. …This is a portfolio [Glyphs] we did in 1995 with Terry Winters,2 which is linoleum cuts. After printing the linoleum we died the paper in indigo. Probably the hardest thing I’ve ever done. DS So you had vats of indigo here? LM Mmm. Which is this beautiful bright yellow until it hits the air and then it turns blue. It’s quite amazing. DS I don’t know if it’s visible photographically, but there is this wonderful variation in the intensity of the blue, and almost a little pulling away from the ink, which gives it an offset, three-dimensional property. It’s not very flat. LM Well this paper was really tortured. LM Japanese paper. I can’t remember which one it is, but it behaved quite a bit like cloth in terms of dyeing, which was nice. … I think it was toward the end of the ’80s that I started doing prints. Wayne Gonzales, Parking Lot (2014), five-color reduction linocut, 11 x 19 inches. Edition of 24. Printed by Leslie Miller and Brad Ewing at Grenfell Press, New York. Published by Grenfell Press. DS That’s when you worked with Robert Gober and Elizabeth Murray? LM Well, Elizabeth was in the ’90s. Bob was in this century. I did a book with Bob for the Whitney a long time ago—Heat with Joyce Carol Oates—but then we started doing prints probably six or seven years ago. DS And when was the first solo print that you made and with whom? LM He did a lot—two woodcuts for the book, and about 37 other woodcuts. DS I think that the prints that Joel did with Leslie are incredibly vivid and present in not just an optical way, not just in terms of image and color, but in a way that almost surpasses the presence of his sculpture. It’s just more vibrantly present intellectually. LM I think that we’ve done some good prints and this was our very first print… And here we have a David Storey reduction print [Eat Iron Peas (1992)]. DS So what’s reduction printing in a nutshell? LM The whole print is made from one block. You start by laying down a color and then you start reducing the surface by cutting away. DS And then printing the entire block in a second color. 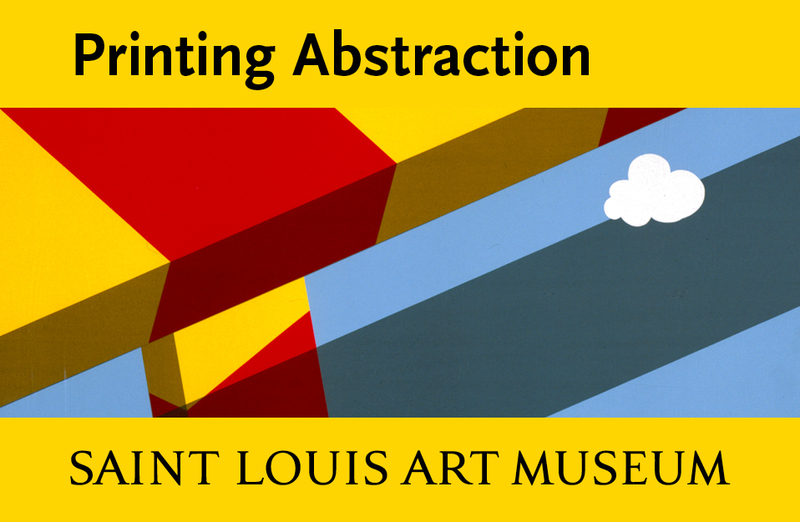 LM You’re editioning as you make the print so you have to be open to the process. DS You’re cannibalizing the block as you go. LM Until there is almost nothing left in your case, usually. 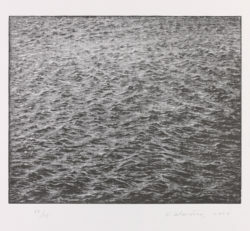 Vija Celmins, Ocean Surface (2000), wood engraving, image 20.8 x 25.8 cm. Harvard Art Museums/Fogg Museum, Margaret Fisher Fund, M25995 Photo: Imaging Department. ©President and Fellows of Harvard College. DS One of the wonderful things about working with a beautiful Japanese paper like this is that the ink—especially the first transparent colors that we laid down transforms the paper into something extraordinarily different than paper. It’s almost like jellied air or something. A lacquered kind of translucency. LM That’s a kozo gampi that I had made in Japan. DS Oh, thank you. These were all printed on the Vandercook. LM It’s a very good press for that because it has an adjustable bed so you can put linoleum on there or wood and it’s super sensitive. DS As I recall there’s a size limitation. DS But a lot of the prints you’ve done have been larger. I do recall once doing a linoleum cut—a long linoleum cut—and running it through the press. LM Oh, from both ends—that’s a great print. DS The options of how you can ink with the Vandercook are amazing. LM Yeah, there are a lot of different things that you can fool around with. Like the Frank Moore print [Prairie (1999)], which came about as an accident.4 I was pulling a proof on Mylar, but I was talking to Frank at the time and I wasn’t paying attention, and I suddenly, basically, printed the friction. If you look at the print you’ll see there’s a fuzzy edge around the buffaloes. I’m not even sure I could recreate it, it was such an accident, but we jumped on it. Used it. DS Again I just have to say that the union of ink and paper [in the Moore print] is out of this world. It’s so different than the whole gorgeous black and white sumptuousness of ink and paper. This is luminous and radiant. The colors are extraordinary. Joel Shapiro, Untitled (1988), woodcut, 23 x 23.8 cm. Harvard Art Museums/Fogg Museum, Margaret Fisher Fund, M22256. Photo: Imaging Department ©President and Fellows of Harvard College. LM Well, that’s all Frank. He was a great colorist. DS Things made here at Grenfell are in many, many major collections out there in the world. How did that start happening? LM You mean my least favorite part of the business—selling the art? I do very little selling. I find it really time consuming and I’m not very good at it. 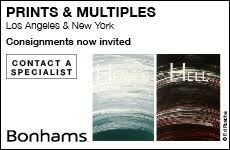 I don’t enjoy it, so I work with print dealers and galleries and rare book dealers. LM You can testify to that! What’s our best reduction print? The last one I think was 35 colors. DS And that I think is remarkable because that lack of restraint isn’t necessarily present with most collaborations with artists and printers in the print studio. LM Well, I think my big advantage is, I do something else in addition, to earn a living, so I don’t have the financial pressure. I’m a graphic designer, I guess you’d call it: I design books and catalogues for museums and galleries. And that’s really the bread and butter. DS Did you have preparation for that before you started? LM No, don’t tell anybody! I learned typography from lead type, just setting type by hand, which is a good way to learn. 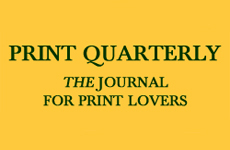 DS I wondered if you might like to talk a little bit about what it was like to be publishing prints in the 1980s. LM Oh, it was so much fun—because they all sold! You could actually earn a living doing it. And I don’t really know what happened. Do you know what happened? DS No, I must’ve been reading a book when it changed. LM I missed the transition, but it’s not the same market that it used to be. The first ten or 15 prints we did would sell out within a year. That was true of pretty much everything. DS The market has changed considerably—and yet there is so much going on in print media right now. It’s a fantastic time with wonderful work being made—smart, beautiful, innovative work. 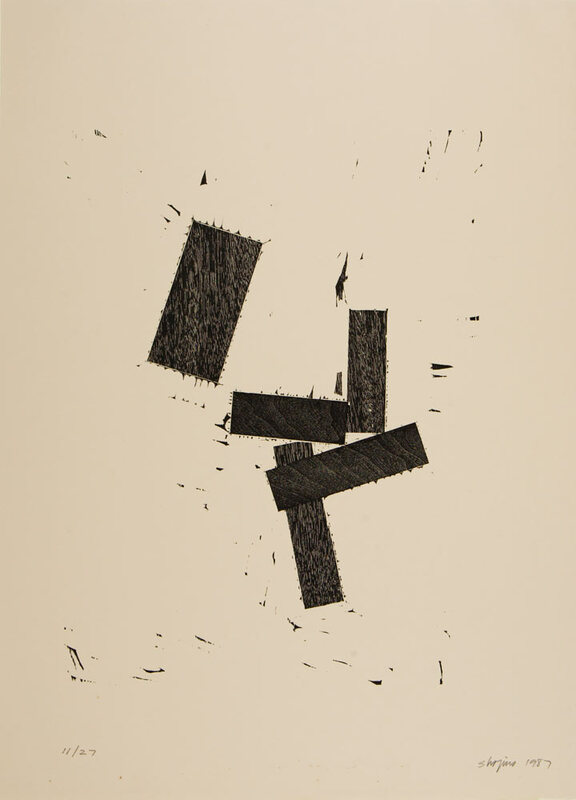 Joel Shapiro, Untitled (1987), woodcut, 53.3 x 39 cm. Harvard Art Museums/Fogg Museum, Deknatel Purchase Fund, M20602. Photo: Imaging Department ©President and Fellows of Harvard College. LM This is a print by Robert Gober. The words are wood engraving and the background colors are relief printing, polymer, in an artist-designed, artist-made frame. So it’s also an object. LM That’s all determined by Bob. He even set up the jig to do the wrinkling, so they’re all the same. DS The little tufts and the perforations? LM That’s all cut by hand. DS Very, very delicate work going on in the studio! LM OCD I think it’s called. I think all printers are. DS That’s wood engraving? Wow! LM Well, but it’s laser-engraved. Just to reintroduce the computer into this one more time. DS That makes me feel a lot better… One of the last things that popped into my mind thinking about this discussion was the relationship between Grenfell and all the digital media these days. LM We’ve incorporated it into the printing here as well with the polymer plates. We could look at quite a few prints like the Frank Moore, which is a polymer plate with wood engraving, and the Gobers have a lot of polymer as well as lead type and wood engraving. The computer does play a role sometimes. 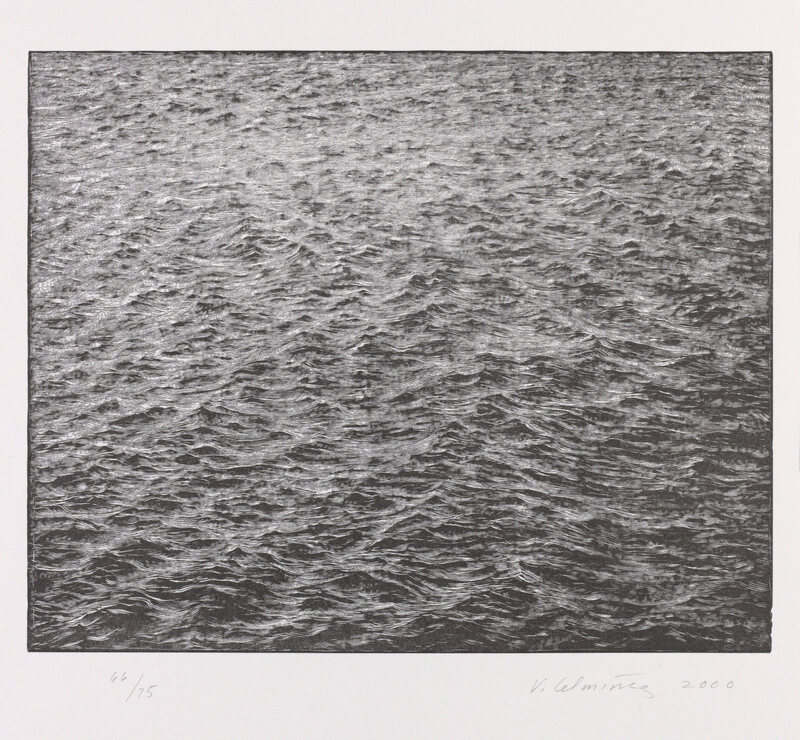 …This is a Vija Celmins wood engraving from 1995. DS I think it’s interesting that so many of the prints that have been done here at Grenfell embrace traditional printmaking techniques. This is a straightforward wood engraving done with a burin on end grain. LM Boxwood, I think it is. Either that or lemonwood. DS About how long was this in production? LM Vija’s prints take a long time. This was probably a year. The larger one was two-and-a-half years. Not that she was working on it every day, but she has a very slow working process, which shows in the work, I think… This is a [Vija Celmins’] book we did for MoMA, for their Library Council fellows program. And it’s called The Stars. DS I have to touch the cover. LM We could start with the cover, which is an etching. One photogravure plate, and then she worked with Doris Simmelink; I think they made four other plates to produce this. This is a text by Eliot Weinberger that was translated into five other languages, just because we could. DS All letterpress. And there are two more etchings in here… This is gampi? DS This is so thin, I can see my hand underneath it. How did she do that? Robert Gober, Monument Valley (2007), wood engraving, 3 5/8 x 1 3/4 inches. Edition of 15. Printed and published by Grenfell Press, New York. LM Well, she and Doris are a great team. This was a fun project. She bought a book on the street in Japan which she loved because of the surface. 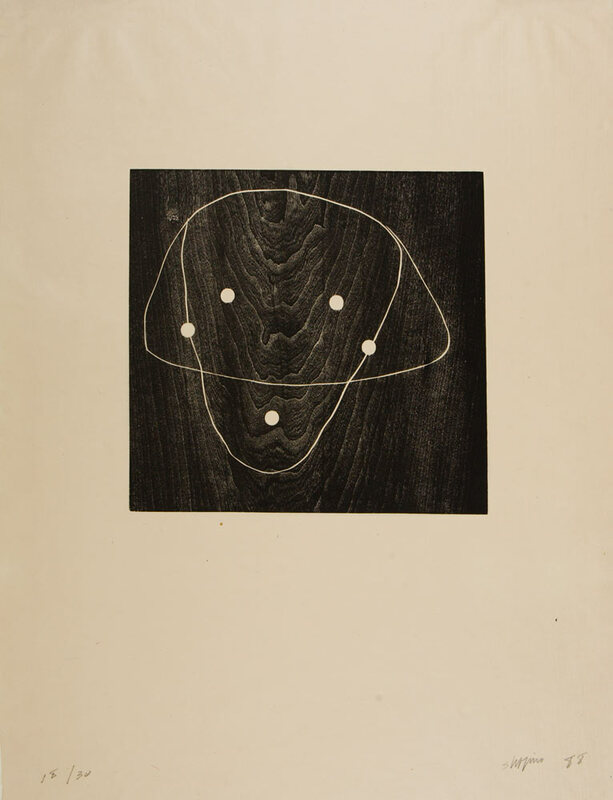 Lothar Osterburg made a photogravure and then she did a lot of work on the photogravure in terms of burnishing. It’s a pretty thing. DS It’s a very pretty thing… Something consistent about a lot of work that comes out of Grenfell is a delightful quality to a lot of the work. There is a buoyancy. It’s animated, right? I think that comes from artists’ realizing that the process of printing here is unique and custom to this moment of working on this block or inking up this plate. And it translates well into the aura of the prints themselves. They have that feeling of going beyond what anyone would expect. 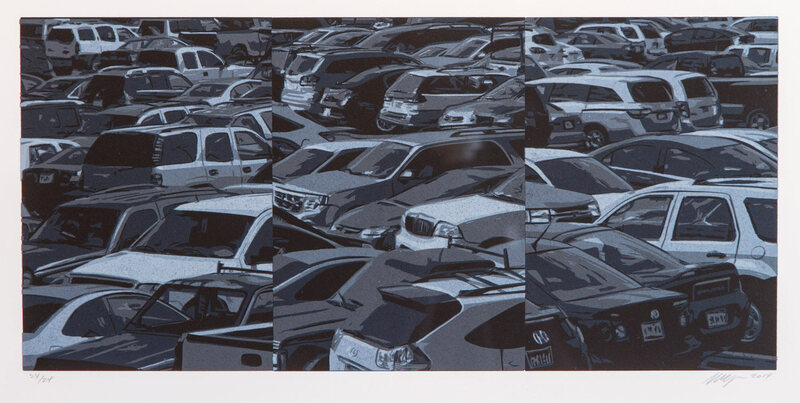 LM I think that’s especially true with the reduction prints—like this one by Wayne Gonzales [Parking Lot Triptych (2014)]. Because you’re creating the print while you’re editioning it you don’t have any idea what it’s going to look like until it’s done. And sometimes you lose it and then it goes in the garbage. DS That can’t be discounted at all—that’s at the heart of the uniqueness of the collaboration at Grenfell Press. There’s no urgency to get it done or do it the way that’s going to be guaranteed. It’s not a guaranteed result. DS Most of the time it far surpasses the artist’s expectations. I know that for a fact. It was way beyond what I thought was going to happen. Every time.